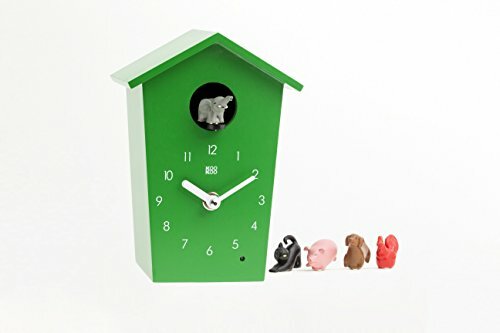 AnimalHouse is a small, funny cuckoo clock with 5 animals: every hour on the hour - instead of a cuckoo - a rooster or a dog or a cat or a pig or the elephant sounds. The rooster sound like a real farm animal. The whole family loves this clock, especially children like the cat meowing or when the dog barks. It is funny when the pig grunts or the elephant trumpet. The case has a nice design and is made of MDF wood. AnimalHouse is available in 5 colors: white, blue, red, yellow and green. A built-in light sensor makes the animals go into their stable and sleep when it gets dark. 5 magnetic animals and a metal rod are provided. If you have any questions about this product by KOOKOO, contact us by completing and submitting the form below. If you are looking for a specif part number, please include it with your message.